Much has been made of the health benefits of the Mediterranean diet, and this trial—a follow-up examination of the large PREDIMED diet study—confirms its benefits. A traditional Mediterranean diet includes plenty of fresh fruit and vegetables, whole grains, beans, nuts, seeds, and healthy fats from olives and fish, with little red meat or dairy. In this study, adults 55 to 80 years of age without diabetes (but with other heart disease risk factors) were assigned to either a Mediterranean diet with extra virgin olive oil, a Mediterranean diet with nuts, or a ‘control’ diet which was simply advice on low-fat eating. After about four years of follow-up, those in the Mediterranean diet group had a 30% lower risk of developing diabetes—even though weight loss amongst all groups was the same. In our opinion, this study strengthens the argument that food choice is more important for a healthy metabolism and disease prevention than counting calories or fat grams. What’s remarkable about this study in contrast to others is that the Mediterranean diet appeared to be protective against diabetes, despite not showing improved weight loss over the control group. Typically, diabetes risk is usually connected to weight loss alone—not actual eating patterns. But a diet rich in whole plant foods, like the Mediterranean diet, is powerful medicine. Food is much more than just calories and fat: it’s the total package of fibre, vitamins, antioxidants and other nutrients that affect the metabolism of the body for better or worse. An eating pattern based on plant foods, like the Mediterranean diet, is a sure bet for better health. If you haven’t already jumped on the Mediterranean bandwagon, now might be the time to take action. The original research review was published in The Annals of Internal Medicine. Link to abstract or free access the article. 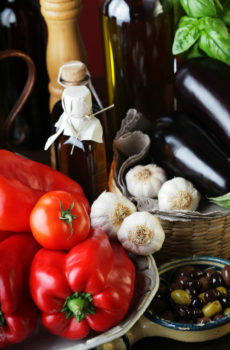 For a look at the Mediterranean Diet Pyramid.